An earthenware soup tureen printed in blue with a titled view; The Hog at Bay pattern. 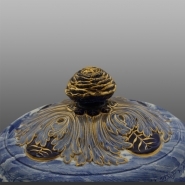 The knob and handles have been painted with a blue ground and gilded decoration added. Spode originated the Indian Sporting series c. 1809, based on T. Williamson's Oriental Field Sports first published in 1807. See the source print below. For other examples in the Indian Sporting Series click here.